On the morning of the 15th of September 1916, after the standard devastation of an artillery bombardment had lifted, mixed in with the whistles and shouts of the infantry, a new sound could be heard coming from the British lines. Roars of mechanical engines and the clacking of metal plates, the mist and smoke obscured the source of the noise until it was at close quarters. Steel beasts lurched out from the shell-cratered no-man’s land, crushing barbed wire beneath its tracks, cannon and machine guns fire cutting down the Germans. Many Germans panicked and fled to the rear, some more brave (or foolhardy) ones fired signal rockets in the air to attract artillery fire, others just froze in terror and were slain where they stood. The aftermath of the first use of the new British secret weapon saw the German war machine scramble for a viable solution to combat these ‘devil’s coaches’, as the press came to call them. At first, the Germans issued K-bullets (armour piercing rounds) in greater numbers to the infantry, then came the retraining of the artillery to react quicker and with better accuracy. After this, came a new defensive network which integrated special direct fire 7.7 cm FK 96 field guns in an anti-tank role just behind the front lines, as well as widening the trenches. However, the German High Command (OHL) realised they needed specialist anti-tank weaponry in order to deal with tanks more effectively. The first purpose built anti tank (AT) weapon was the Tankgewehr M1918 produced by Mauser and with this, coupled with specialised tactics, the German High Command thought they had enough to deal with the tank problem. However, as 1918 came, tanks were now being fielded en-masse and with good effect, so OHL needed a new weapon to deal with tanks. In July 1918, the OHL asked Krupp and Rheinmetall to produce a prototype AT gun using old 37mm revolver gun barrels and the 7.58 cm Minenwerfer carriages. The next month, August, tests were held at Kummersdorf. Rheinmetall came with three 3.7cm models and one 2cm model, Krupp produced one 3.7cm model, Lieutenant Colonel Fischer bought one 3.7cm, and Stahlwerke Becker attended with a 2cm prototype. A 3,7cm Rehinmetall TAK on the training field, showing the turn spike. Source:- Das Gerät der leichten Artillerie vor, in under nach dem Weltkrig. 1. 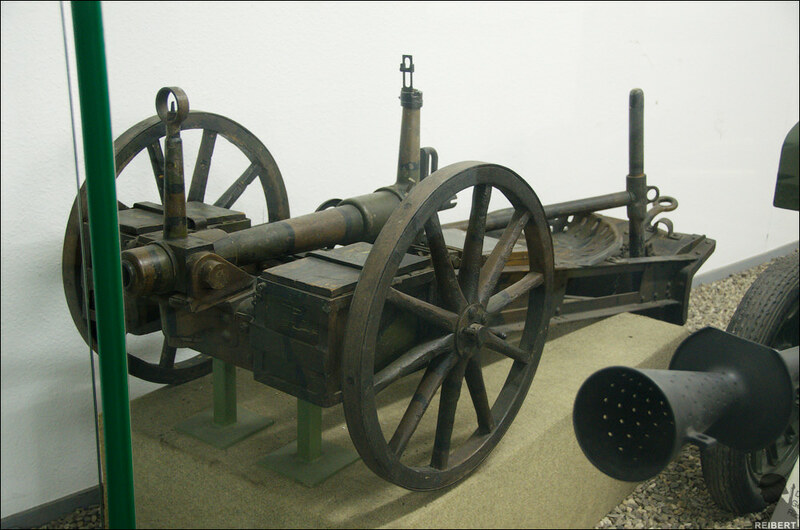 Following the original order, a 3.7cm revolving gun barrel was mounted onto a 7.58 cm Minenwerfer carriage. The carriage had the unnecessary material striped away and the retaining ring from the barrel replaced. 2. 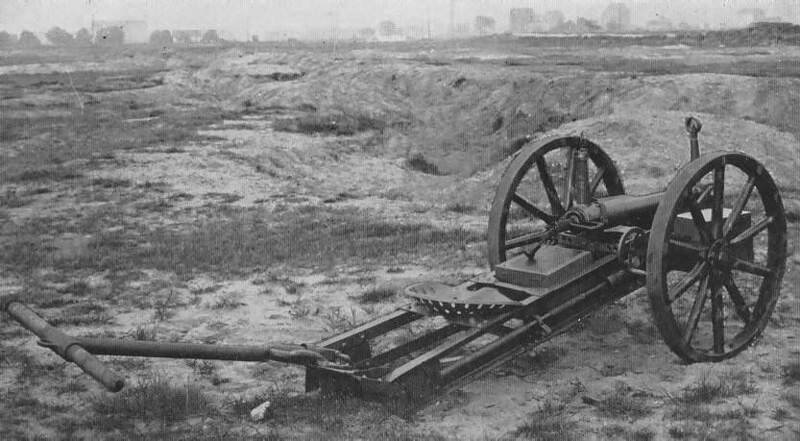 A 3.7cm revolving gun barrel placed on a sheet metal sled. 3. 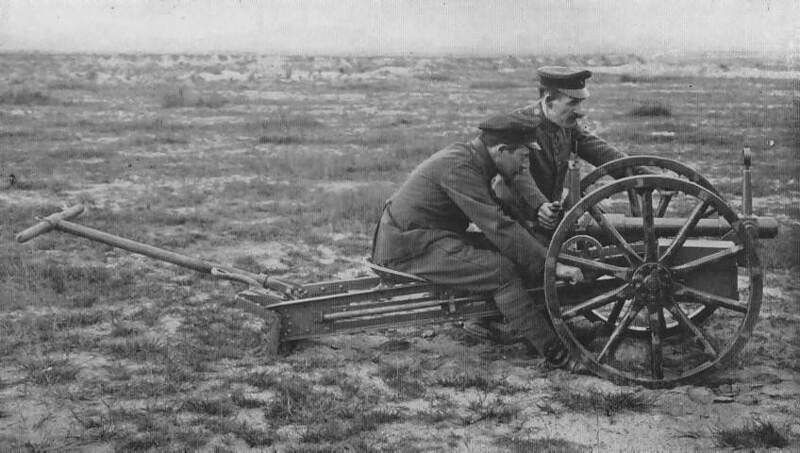 A 3.7cm revolving gun barrel placed on a simple fixed wheel carriage. The tests included a series of movement and deployment demonstrations, precision shooting at 200m and 500m, and an armored test at 200m. At the conclusion of these tests, the representatives from the OHL decided upon two models, the Rheinmetall version on the simple fixed wheel carriage, and Krupp’s model. The Krupp model utilised the 3.7cm barrel on the Minenwerfer carriage, but it wasn’t stripped down and the barrel was in a sheet metal sleeve and was held in place by heavy bolts. This made it weigh about 300kg without any additions. Also, the procedure to get it ready for firing was complex and needed precision. In comparison, the Rheinmetall version had a very simple carriage which used the 7.58 cm Minenwerfer carriage’s wheels, had attachment points on either side for shell boxes (meaning that the gun could carry up to 24 shells), and the axle ran straight through the carriage. The barrel was the exact same as the 3.7cm trench cannons, it had a handwheel for traversing and a double screw for elevation. It had a rear sight which could be sighted up to 2,100 metres and moveable 10 degrees left or right and a fixed front sight. The weight came to 175kg with full ammunition and additional stability weight was given by the gunner. The gun in ready position with gunner and spotter. Source:- Das Gerät der leichten Artillerie vor, in under nach dem Weltkrig. 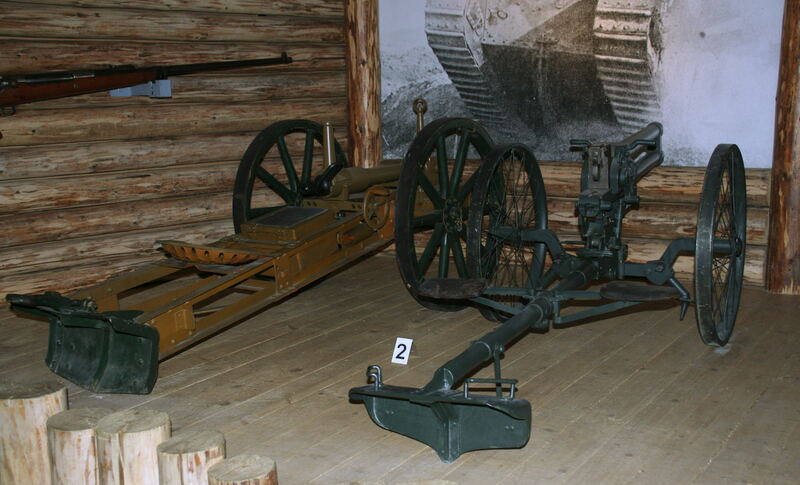 For transportation, the gun could be limbered up with the 7.58 cm Minenwerfer cart and towed by a horse or donkey. It could also be pulled by 4 men using straps. The wheels were detachable, so it could be ’dug in’ and its profiled lowered. It fired a 465g armor-piercing shell (some used a tracer) that showed a performance of penetrating a 15mm thick armored plate at 500 metres. There was also development of an HE explosive shell that was meant for close defense but unfortunately, there is no information on it. OHL ordered 250 from Krupp and 350 from Rheinmetall, with at least 12 of each model being delivered in mid-September to allow troops to begin training. However, due to the complexity of the Krupp design, they couldn’t deliver and so Rheinmetall’s simpler model was chosen as the sole AT gun for the Imperial German Army. An order was initially placed for 300, and then increased to 1,200. Rheinmetall’s simple, makeshift design allowed them to bring the gun to mass production in a short time. Also, its short development time of 2 months makes it one of the fastest programmes ever in the history of modern weapons and is a testament to Rheinmetall’s skill. By the time that the guns fell silent on the 11th of November 1918, 600 of these guns had been produced and many were on the frontlines. The ‘3.7cm Tankabwehrkanone Rheinmetall in starrer Räder–lafette’ was to be deployed with the Minenwerfer Battalions, with each unit receiving 32 guns. Training occurred in the same areas as used by the Infanteriegeschützbatterien (Infantry Gun Batteries) under the instruction of those Infantry Gun officers who had experience dealing with tanks. Each gun would have 7 men, a gunner, a loader, a commander, and four assistants (who would also protect the gun team by providing covering fire against accompanying infantry). Two guns would form a team under the direction of a four-man command team (commander, 2nd in command, 2 runners). The two guns would be deployed in conjunction with each other to provide mutual and overlapping fire. 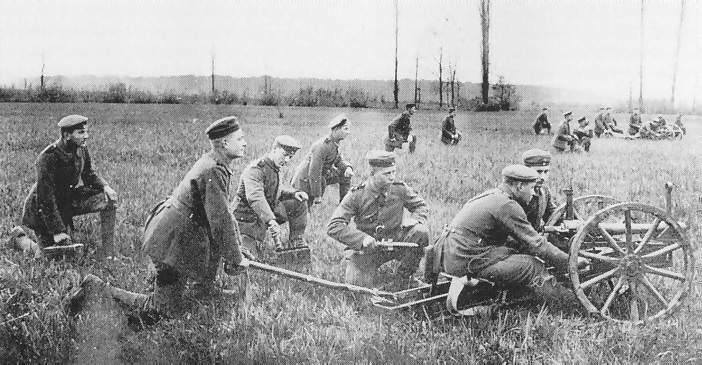 A gun team out on maneuvers in Summer 1918. Notice the positions of the men. Source:- Das Gerät der leichten Artillerie vor, in under nach dem Weltkrig. Very little is known of their effectiveness on the battlefield, but given the late date of development, they couldn’t have been deployed before the end of September/beginning of October 1918. We know that Army Group Rupprecht of Bavaria ordered 228 of the guns in an attempt to stem the Anglo-Belgian advance in its area of operations, however, they received only 96 on the 5th of November 1918. It did leave a legacy. When the Reichswehr decided in 1925 to develop, in secret, anti-tank weapons, the Heerswaffenamt asked Rheinmetall to produce an upgraded version of the 3.7cm TAK. The low profile, light weight and ease of maneuverability of the TAK was essentially copied and modernized and the end result was the 3.7cm TAK L/45. Von Muther, A. 1932. Das Gerät der leichten Artillerie vor, in under nach dem Weltkrig. 1st Edition. Berlin, Germany. Verlagasdruckerei Bernard & Graefe. A special thanks to Dr. Dieter Storz of the Bavarian Army Museum who helped provide material for this article. Special thanks also goes to Jari Kähönen for helping with translating.